Fuzzball & Scuzzball - Have You Heard the News? Comic 207 - Have You Heard the News? 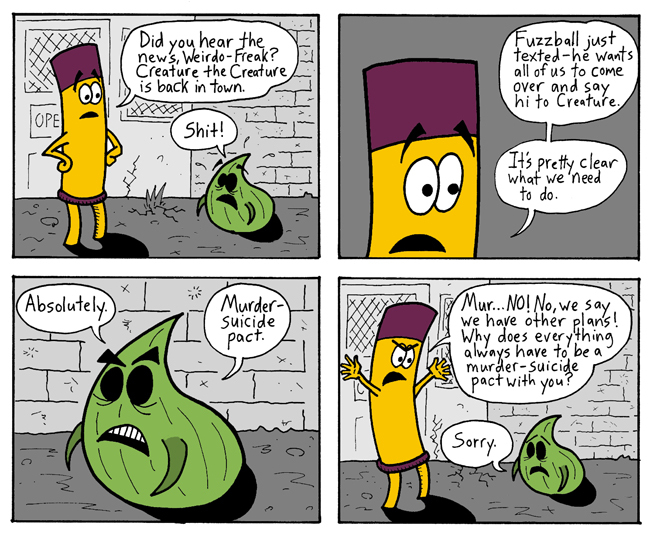 In 2005 I took a break from writing and drawing Fuzzball & Scuzzball comic strips and didn't resume until late 2013. That's why this is the first time text messages have ever been mentioned in the strip; technology was much more primitive back in 2005. I didn't even have a cell phone. This is the first time I've drawn a comic featuring Chappy and/or Weirdo-Freak since 2005, and I'm glad to have them back. I've missed those guys. If you're unfamiliar with them, check out the Great Jumping-On Point for New Readers. If you're wondering who this "Creature the Creature" is, jump back just a few episodes to the beginning of this current storyline. Next: Fuzzball and Creature! And flash cards!